Navajo Indian weaving bolster pillows in fine condition. 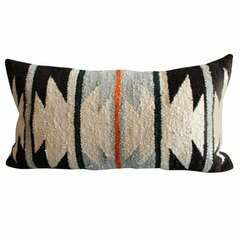 These were originally saddle blanket weaving's. The backing is in cotton black and brown linen. The inserts are down and feather fill. Measures: 33 x 17 - Smaller pillow 37 x 18 - Larger pillow. Navajo Indian weaving bolster pillow from a very early and evenly faded weaving. The brown and mauve are a fantastic combo. The backing is in a brown cotton linen. 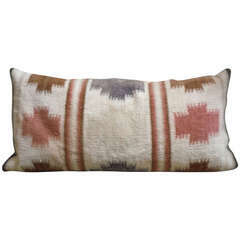 This two grey hills Indian weaving pillow is in fine condition. It has black cotton linen backing and down and feather fill. These unusual colors are quite cool and very early. We are selling as a pair. The condition is very good.